Alternative energy sources will play a large role in transforming the planet into a sustainable and environmentally friendly place to live. Embracing renewable energy is vital to the future of Schaumburg as it does its part to promote clean energy. Solar and wind power are both renewable energy sources and can be converted into different forms of energy such as electricity. With the increasing levels of interest in living sustainably, communities are looking for a change. Solar and wind energy are exceptionally underutilized; in fact, in the United States only 0.1% of the total electricity being generated is from solar power (All Solar, 2009), even though the sun produces enough energy every day to power the entire earth for 27 years. The U.S. has a long way to go in utilizing wind power as well, for currently about 1.5% of the electricity consumed in this country is wind powered. Other countries such as Spain and Denmark receive around 11% and 19% of their energy needs from wind power, respectively (Harrison, 2010). Solar and wind energy is not limited to benefiting the planet, though, for individual communities can also profit. Towns and communities benefit from a larger tax base, which supports schools and local infrastructure. The development and operation of a wind project, which leverages consumer choice to build demand for new wind projects, creates temporary construction jobs and long-term management jobs (Community Energy, 2011). Although the current cost of wind-generated power and present photovoltaic technology still remains higher than the cost of electricity generated from conventional energy sources, with the technology improving and production increasing the costs are sure to come down in the near future and prove to be a long-term economic benefit. As a nation, the United States is beginning to become more proactive: the Obama administration has developed offshore wind resources and the country’s first-ever offshore wind farm. This alone is expected to produce enough clean electricity to power more than 200,000 homes. There has also been construction of 16 commercial-scale solar facilities which will in turn produce thousands of jobs as well as decreasing pollution (President’s Record, 2011). With strides like this, the U.S. will not be behind other countries for long in developing clean energy sources. Cities are responsible for three-quarters of the energy consumption; therefore, cities that are converting to renewable energy sources like solar and wind power can have a hefty impact on the environment. Former Mayor Richard M. Daley set in motion an aggressive plan to make Chicago one of the most environmentally friendly cities in the world. Chicago is now a leader among the largest non-utility purchasers of renewable energy in the country. This plan also seeks wind manufacturers and fosters wind development, for both big and small ventures. Vertical wind turbines have even been made to look like sculptures to be used on rooftops or to stand alone (Priesnitz, 2004). Additionally, the city has entered into the Chicago Solar Partnership with numerous organizations, such as the Chicago Public Schools and ComEd. 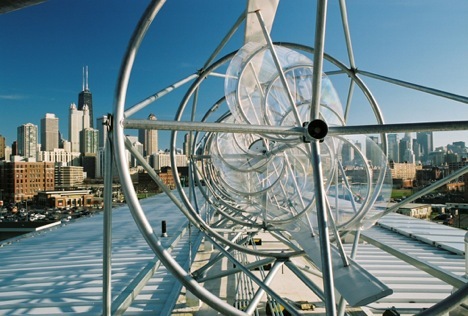 Solar panels have been installed on the roofs of six major museums and has made the Chicago Public Schools the largest school-based solar energy network (Czarnecki, 2003) in the country. Striving for clean energy sources are not just limited to the city. Surrounding suburban areas are also joining the green movement and are ready to venture into solar and wind power. Residents of Palatine, as well as surrounding towns, are inquiring about alternative energy sources and discussed them at a recent meeting. The Midwest Director of Development for Community Energy articulated the benefits of using wind and solar sources, including a cut in cost in electricity bills as well as cutting their carbon footprint. Residents will vote to switch from ComEd to an energy supplier of each individuals choice. Solar panels are one of the simplest energy changes to make for residential use, unlike installing a windmill or waterwheel which can prove more complicated. This could be a sizable move into changing how suburbs use energy. 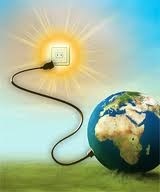 Clean power is a necessity as the world’s growing energy needs increase. Chicago and nearby suburbs, such as Schaumburg, can assist in supporting and advocating for clean energy sources. Going to town meetings, voting on alternative/clean energy plans, and writing to government representatives are just a few ways to transform our towns and cities. Solar and wind energy are two energy sources with high efficiency, significant economic development potential, and a virtually endless source of power that brings us a step closer towards a cleaner and healthier planet.